Sydney’s suburb of Kengsington or ‘Kenso’ as you may refer to it, just about has it all in regards to being an ideal location. Just off the M1, a short drive to the CBD one way, or the airport the other, there’s easy access to almost everything you could want. Unfortunately, you don’t get to live in such a place without working hard, you probably live busy, and somewhat stressful life. There are lots of ways that you can save time in everyday tedious tasks, technology has helped us save time in our day to day lives too. There are some tasks that are always going to require human effort, technology can’t do everything. One of these jobs is junk removal, maybe one day a robot might be able to do it, but that won’t be for a while! Same-Day Rubbish Removal isn’t a team of robots, but we can do everything for you when it comes to junk removal. You’ll love having our friendly team come to collect your waste way more than an unfriendly robot! Just let us know what needs to go, and we’ll have it out of there in no time. Our team have had over 10 years of experience in rubbish removal, which is why we’re so efficient now. We’ve managed to cut out a lot of the costs that are usually associated with the service so that it is something you’re able to afford. We know all the shortcuts around Sydney, so we can get to your Kensington location, or anywhere, fast. We regularly find ourselves getting called out to homes where there has just been a new furniture or whitegoods delivery, and they’ve got no room for their old/broken items. Couches, mattresses, fridges, washing machines are some of the more common items, but we have seen just about everything. No matter the size, or type of item, there’s no job too hard for our team. You’ll also be pleased to know that here at Same-Day Rubbish Removal, we all care a lot about the environment and do everything that we can to minimise the impact that your junk may have on it. Because of this, we try to recycle everything possible! It doesn’t matter where you are located, whether it be next door in Kingsford, up in the CBD, or out in the Western Suburbs. 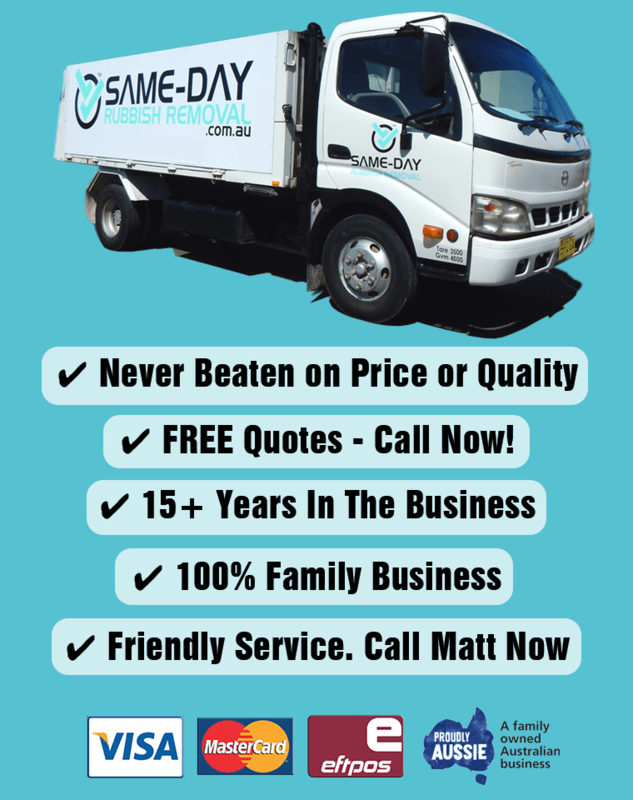 Even if you’re up in Marrickville on the North Shore, Penrith, or even Campbelltown we can get the job done fast. When we come to your home or business, you just tell us what needs to go and our team will hand load everything into our truck. It couldn’t get any easier for you, you’ll be saving hours of work, and saving significant money when you have us do the job. Give our friendly team a call on 0402 737 046 now and talk to them about your situation and whether our service is the right thing for you. Many of our customers are so happy with our service that they keep calling us back. We look forward to hearing from you. On the other side of the M1, Zetland has a similar feel to Kensington, with Southern Cross Drive giving easy access to the city or airport, location doesn’t get much better for someone who visits these places regularly. Green Square train station is also very handy, with many Kensington residents having to use this station also. If you live here, you probably live a very busy life and there’s a chance you’ve got jobs around your home that have been needing attention for a while! There may be several items that you no longer need or are broken and need disposing of – you shouldn’t let them clutter up your home any longer! Our team provide super-fast service to Zetland, so if you’re ready to clean up, there’s no reason to wait. Give us a call now for a free quote. A short drive south from Zetland, Rosebery is handy to Sydney’s great golf courses and the airport. If you have friends who are keen golfers, you’ve probably had them visit and stay a few times – fly in, stay at your place, play golf, and leave again! Many Rosebery residents have bought here for this reason – to be able to play lots of golf locally, and to be able to easily fly interstate or internationally for more! If you do enjoy golf, you’d probably rather be playing it than cleaning up and disposing of rubbish, and fortunately you don’t have to. 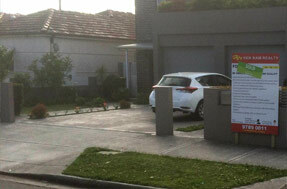 Same-Day Rubbish Removal can come to you today and take away whatever junk you need gone. You won’t believe how good our prices are either – call us now! Large enough to almost be its own suburb, UNSW is located in Kensington and has over 50,000 enrolled students! Students are known to produce lots of garbage, living off fast food and two minute noodles, but there is also often a lot of large waste items made in a university setting. Needing the latest in technology, there is often a lot of e-waste to dispose of, and with so many students coming and going, there is a significant turnover of furniture. 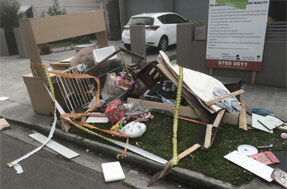 If you live, work, or study at UNSW and need to get rid of some junk, give our team a call!